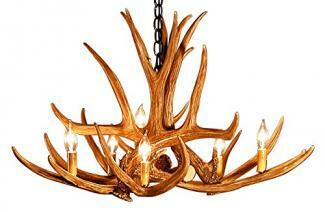 Are you wondering how to build an antler chandelier? The task is much easier than you might think. In no time at all, you will have a one of a kind, eye popping lighting feature that costs you way less than pricey store bought chandeliers. Here is everything you need to know to construct your own chandeliers. 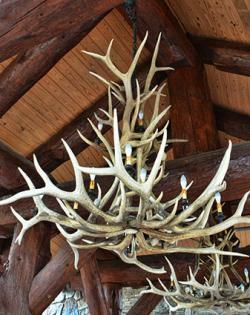 Before delving into the project, let's clear up a few questions and basics about antler chandeliers. First, consider the question of the antlers themselves. Many people think that the natural beauty of these kinds of chandeliers would be the perfect fit for their décor, but they shy away from actually adding them to their home because they think it is inhumane. If you have pictures of forcibly separating a deer from its antlers, only so you can have a lighting fixture you like, think again. The fact is that all male deer shed their antlers every single year. They get the job done by banging their antlers against trees until they come off, making space for a fresh set, so you don't have to worry about harming any animals to get the antlers for your project. Next, be aware that there are antler chandelier kits you can buy that include everything you need for your project. These kits are available at any hardware store, and there are several different brands on the market. The steps that follow will assume you are NOT using a kit. If you have a kit, simply follow the manufacturer's instructions. A word to the budget conscious: completing the project following our steps rather than investing in an antler chandelier kit will save you money. Ok, then! On to the fun part! Antlers can be purchased at hardware stores and at hunting goods stores. Of course, you can also find your antlers in the woods, free of charge. Deer shed their antlers in the winter months, so that is your best antler hunting season. Be sure to find antlers that are similar in size and color and that fit your design idea. Colors can be played with, but vast differences in size will make your chandelier construction difficult. Check your local hardware or home improvement store for a package deal that includes the right number of wires and light bulbs for the chandelier you are designing. You can also purchase the items individually, but the kits are more cost effective. Even store bought antlers should be cleaned. An oil based soap works best. Next, you will need to drill holes in the tip of each antler, where the wire will come out and a light bulb will be attached. Last but not least, give the antlers a few coats of polyurethane. Play around with sheen levels to get your desired effect. Using a drill and strong wires, attach the individual antlers to each other in the design of your choosing. Drill a hole through the parts of each antler you want to run wire through, and then secure the antlers together in your finished design. Once you have the look you want, sodder the wires to seal. Take your electrical wire, and run a piece through each chandelier, emerging through the hole in the tip you created when you prepped the antlers. Gather these wires and connect them to the electrical wiring in your chandelier mount in your ceiling. Make sure to use enough anchor screws to support the weight of the chandelier from the ceiling. Adequate support is a must if you want to avoid a disaster! --- Voila! Your chandelier project is complete.